Adobe’s Flash Player is going the way of the Dodo, but its extinction is not cause for concern. Flash Player has been a huge problem for years, and its ultimate demise will be celebrated by most in the tech world. Flash Player, whose security has had more holes than Swiss cheese, has long been a burden. Earlier this summer, Flash Player was forced to release updates with 36 security patches in one week! Steve Jobs, who was famously anti-Flash, released this scathing statement in 2010 and refused to make the iPhone Flash compatible. 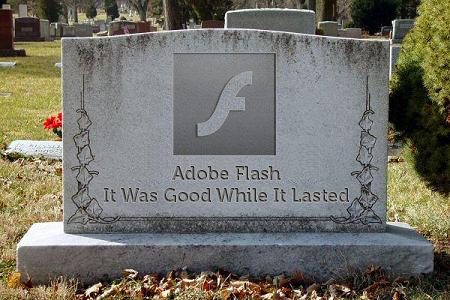 By 2011, Adobe announced the end of Flash Player for mobile devices. Google’s newest Flash related announcement might be the death knell. Last week the Chrome team announced that it would block Flash applications, including the Flash Player, from loading in its browser. Chrome promises that these changes will lead to lighter websites that load faster and consume less battery life. Chrome’s decision will likely be great for the web as a whole, but in the video streaming world, it was a cause for some concern. Though many users have abandoned Flash Player over the past few years, it is still pretty widely used. While some platforms, including Chrome, already default to HTML5 Players, until now these browsers have still been able to load Flash and fallback to Flash Player. So what does the death of Flash Player mean for your video streams? First of all, don’t worry. Though many viewers use a Flash plugin to stream HLS in their browser, they don’t need to! In fact, we wrote a post last year to show that you can deliver HLS streams better without Flash! All major mobile browsers natively support the HLS protocol. Unfortunately, all desktop browsers don’t have native support. Once upon a time, this may have been a problem, but today this issue can be circumvented easily. Two open-source libraries, hls.js and video.js, will effectively transmux your HLS streams into a byte stream, called Fragmented MP4, seamlessly, on-the-fly. This Fragmented MP4 is then playable in-browser thanks to the Media Source Extensions API (MSE). Now your viewers can play your HLS streams anywhere, without that annoying Flash Player plugin. Integrate a library like hls.js or video.js into your player. If you’ve built a custom Flash Player, this can be a bit tricky. Consider this a good excuse to move to a new player. There are so many great, modern players today that you simply don’t need to build a custom player from scratch. Think of all of the time you can save by not having to maintain your own player! Make sure the library can play your streams. We’ve found that many HLS streams in the wild are not actually valid streams. We’ve found a variety of different issues, including: video samples overlapping, missing metadata, unaligned iframes, streams that contain frames of different sizes with no #EXT-X-DISCONTINUITY, comments between EXTINF and segment URL, decoding issues and more. Though Flash Player can handle some these issues automatically, hls.js frequently cannot, so it’s important to make sure your streams are configured correctly. You can check your stream’s validity here and playback on public testers here: hls.js, video.js, JW 7.4. The magic is in videojs-contrib-hls.js. It is set up to support hls.js and video.js events and handle the basic video tag to detect if native hls is supported. You can get the latest bundled plugin here. Send your viewers an error message and explain the situation. This is the default for hls.js. For many content providers, whose viewers come from modern browsers, this might make the most sense. Including Flash fallback is complex and may simply not be worth the hassle. Load Flash Player (😢😢😢) and try to play the stream in Flash. Old browsers, like IE 8 - 10, represent roughly 20% of Internet traffic, so many broadcasters will want to enable fallback. Unfortunately, hls.js doesn’t include a Flash Player fallback mechanism, so at Peer5 we decided to fallback to video.js5's html5 contrib-hls playback technology. Videojs5’s Flash fallback is a mature solution that utilizes its Flash contrib-hls technology. Our plugin bundles both hls.js and contrib-hls and, therefore, includes logic that can handle any situation. Here’s a demo page you can play with. So Flash Player is dying, but don’t worry about your HLS streams. Whether natively or through MSE, all modern browsers will support your streams if you simply add Peer5’s open-source code to your player. As an added bonus, your streams will also support fallback to Flash Player for old browsers. Now all of your HLS streams are handled for you completely seamlessly, and without Flash.